Posted on 11/23/2015 by Michael Management. 0 Comments. As an SAP professional, your SAP skills are part of your personal brand. You’ve gone through SAP training, you’ve got SAP experience in the office, and you’ve every right to show it off. It makes you stand out among the competition. However, there are always impostors. It’s easy enough to add a few lines to a LinkedIn page or resume, whether or not it’s true. For SAP consultants or those seeking new employment, SAP Skill Assessments are a one-click solution to prove that you can both talk-the-talk and walk-the-walk. Showing you’ve passed an SAP Skill Assessment ensures employers you’re an asset to the company, and it can be verified online with a unique code. This badge of aptitude is part of your professional brand, separating you from the crowd. Employers previously had no easy way to vet new hires based on their professional capability but now it’s as simple as the click of a button. 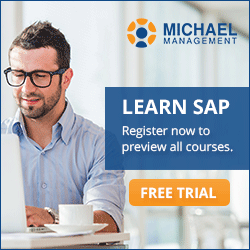 With 48 Skill Assessments, all SAP modules are covered. You can be sure your new team member is up to snuff right off the bat. A company’s brand ought to be known for its exemplary employees. Assessments highlight areas that need improvement, so employees can focus on the SAP training they need most. With progress tracking and monitoring, administrators can measure the impact of training for each individual. The SAP Skill Assessments are timed and made of 50 random questions on the given topic. You can’t simply learn the test, as the test changes each time. However, the test can be repeated as often as needed and the results are shown on a personal report card for each assessment. For all SAP professionals, add that feather to your cap. You can prove you’re an SAP expert with your SAP Skill Assessment score, and that’s worth bragging.